A few months ago, when it was announced that Microsoft would be retiring Game for Windows Live, Joe and I were left with two options: Have our game become obsolete by this coming summer or take it upon ourselves to have GFWL removed and replaced with Steamworks. For us, this was a no-brainer. By handling the GFWL removal ourselves, we were able to expand the nature of our agreement with Microsoft and be allowed to self-publish our game on services other than Steam and Amazon.com (which Microsoft still handles). Being able to self-publish is exciting as it offers us an opportunity to finally derive some revenue from our game. The first partnership under our new deal is with GameFly Digital and to celebrate the occasion, we are offering the game at 75% off from Feb 3rd to Feb 16th . If you want to try out ITSP, there is no better time: You'll be supporting us as developers while getting a cool game for a fraction of the price. And to make the deal even sweeter, you can use codes, FEB20OFF or UKFEB20OFF to save an additional 20%! 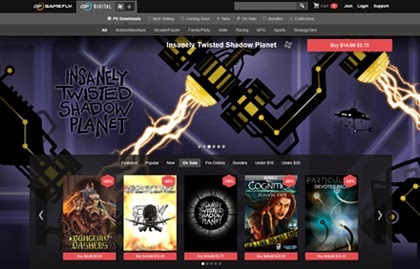 Click here to buy Insanely Twisted Shadow Planet on Gamefly Digital. Wow, I just found ITSP under "steamos + linux" tab. No files available for download yet, though.